If you are visiting Israel, renting a car with Crown Travel is a great way to get around in comfort and at your own leisure. 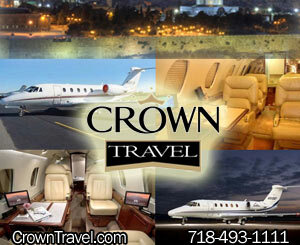 Whether planning a sightseeing tour of Jerusalem and Eilat, or planning a business trip to Tel Aviv, Crown Travel will have a vehicle to suit your requirements. Let Crown Travel do the hard work and search the market to save you time and money on your next rental car in Israel including in local areas such as Kfar Chabad, Jerusalem Neighborhoods. 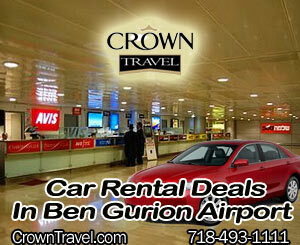 Book car rental in Israel with friendly and helpful support from Crown Travel representative and no hidden fees. You can choose between leading car rental companies in Israel to find the best deal on car rentals in Israel. Car Rentals bookings with Crown Travel in Israel are made with our suppliers such as Hertz, Sixt, Budget, Dollar Thrifty, Europcar and other global and local car rental companies. Copyright © 2019 Crown Travel – Your Destination is our Business. All Rights Reserved.